I haven’t really updated about running in a while so I thought this would be a good time for a running state of the union. 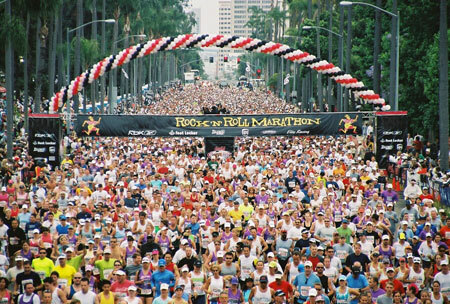 You might remember that I am running the San Diego Rock n’ Roll 1/2 Marathon in less than two weeks. I am so excited! I’ve never been to San Diego before and I am so excited to run my second 1/2. I haven’t posted about my training much. In all honesty, the build up to this 1/2 hasn’t been the same as the build up to Malibu (my first 1/2 back in November. Since Malibu was my first 1/2 the training was more special. Every long run was a new personal distance record. When I signed up for Malibu (almost a year ago!) I had never run further than 4 miles. After I had a runners high that lasted for a week. It really was the most incredible feeling. This time around I haven’t been as excited but in the past few weeks, especially since finals, I’ve been starting to get excited again. I’ve also learned some great lessons. For starters, I made an ambitious training plan which I didn’t really follow. I shouldn’t have made my plan before classes started. I have, however, been working out hard. In addition to running I’ve consistently gone to yoga twice a week since January. I’ve noticed some changes in my body. I’ve toned up and right now I am in the best shape I’ve ever been in. I’ve lost another size since my last 1/2 and have upped my mileage to greater than 20 a week. All in all, I’ve been working out 6 days a week nearly every week with the exception of some random rest weeks, like Spring Break for example, when I let shopping be my cardio. I don’t time myself when I run so I’m not totally sure what to expect in terms of my time on race day. It would be amazing to run faster than I did in Malibu. I ran Malibu at a just over 10 min mile pace for 2:11. Malibu was super hilly and hot plus when I was training for Malibu I was ONLY running and not cross training at all. In terms of race goals I just want to have fun. So much is left to chance with a race. Who knows how I will feel on race day or what the weather will do. My major race goal is to have fun, but don’t get me wrong, I really want to set a PR. We shall see! Another reason to be excited for SD? LCCDAD is coming to So Cal to watch me run! He has never seen me run a race before and I haven’t seen him since December so I am very excited to spend some quality time with him. After completing SD I am going to turn my attention to marathon training! You may remember that I registered for the Chicago Marathon last February. I am so stoked to tackle the marathon. I’ve been reading up on marathons for a while and I am working on a training plan for Chicago. For the record: its only going to be a partial plan. I’ve learned from my mistakes this semester. I haven’t selected classes for Fall yet and I refuse to commit myself to something I’m not 100% sure I can keep. Once I pick classes I will plan my week day workouts. I will however plan out my weekends (which I know will consist of long runs and my favorite yoga class). So many amazing things are on the horizon, I cannot wait to share it all with you!